I’m tempting fate by trying to cram this post into the wee hours of the morning, but I think everything will turn out okay: This is lpe. lpe is short for “lightweight programmer’s editor,” and while I had no particular trouble moving through most of lpe’s basic functions, I will be honest and say that lpe just didn’t thrill me. It has most of the fundamentals — editing modes, search and search again, cutting and pasting by lines, and so forth — and even has a few bonuses that I look for, like onboard help and a helpful status bar. lpe also seemed perfectly comfortable with the most awkward of terminal sizes, even bizarre 10- and 12-column vertical bars, although it waits for a keypress to refresh its display … which is probably wise. lpe seems to lack a certain charm though, at least for me. 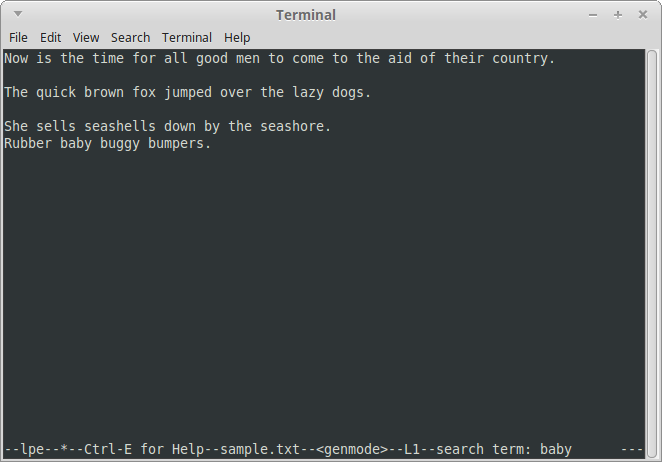 I see that it has quite a few keystrokes aimed at programmers, including options to dump the contents of the “clipboard” into a shell prompt, or sed or awk, or even as a SLang command. And although I barely scratched the surface, I tinkered briefly with the “command repeater” and macro options. I don’t recall seeing those in some other lightweight editors, but that’s not much praise since there’s a very wide field for comparison. So what’s it missing? Why doesn’t this enthuse me much? I can’t say for sure. It doesn’t have color, which of course breaks my heart. 😐 And most of the key commands are understandable, but not necessarily intuitive, and tend to use the double-control-key approach found in emacs, et al. P.S. : I linked to the texteditors.org page above because the link they have for the home page is dead, and I haven’t been able to find a live one anywhere. lpe is in Debian but not Arch/AUR, but the Debian packager apparently didn’t include a home page either. If you find one, let me know. This entry was posted in Linux and tagged editor, text on 2015/01/16 by K.Mandla.